Read our Analysis of the GBPUSD in this week’s JRC Capital Management Weekly Outlook. In the past weeks and months, the Greenback was able to gain in value against most currencies – such as the British Pound. Consequently, the GBPUSD fell by almost 12% since April. On the one hand, the Fed raised the interest rates three times this year and another one is expected for December. On the other hand, the ongoing concerns of No-Deal-Brexit put pressure on the GBPUSD. More and more companies are preparing for No-Deal-Brexit and unless one of the two parties will back down this remains a very likely scenario. At the beginning of the month, the GBPUSD was able to recover a bit. The price approached the 38.20% Fibanocci Retracement and fell subsequently by 400 pips. Meanwhile, the price is below the psychological level of 1.3000 US-dollar per British pound. In case of further downward pressure, the GBPUSD could intersect with an upward trend line, which starts in October 2016 and currently runs at 1.2742. If the price falls below this line, another support area is located at 1.2600. This area acted several times as a support and resistance in the past. In case of a recovery, the first resistance is situated at the psychological level of 1.3000. 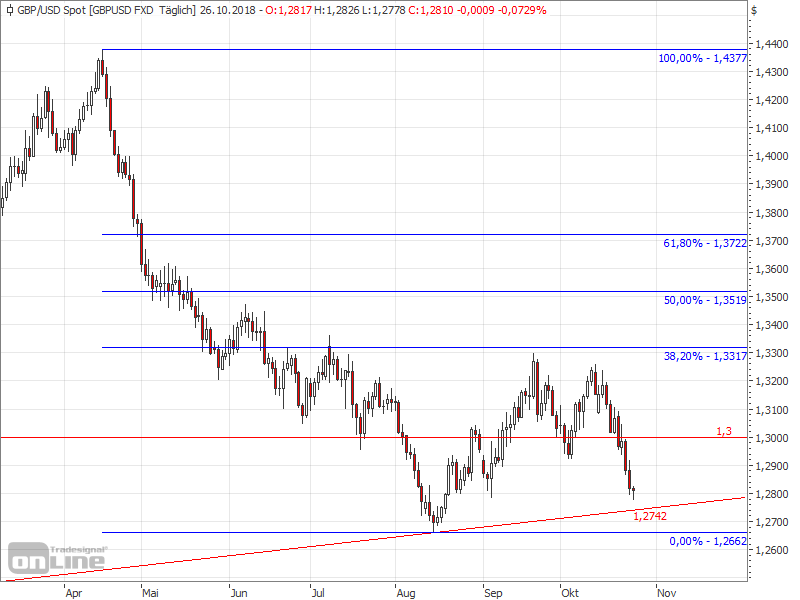 At the 38.20% Fibonacci Retracement at 1.3317, we can observe another resistance.